You'll be £19.99 closer to your next £10.00 credit when you purchase A Cruel Captivity. What's this? 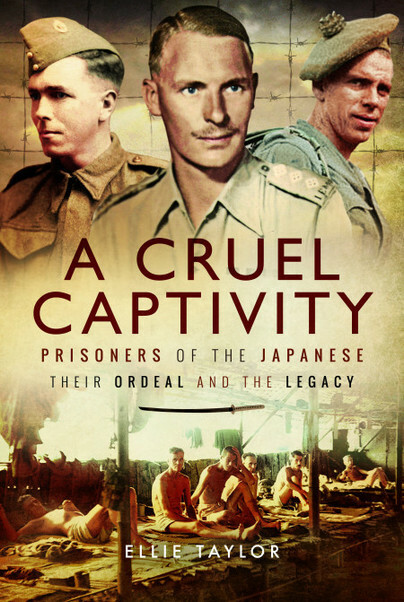 The terrors of Japanese captivity and the legacy seen through the stories of 22 POWs. The harrowing story of the brutality and cruelty of life in a Japanese POW camp has been told in many books but this is a novel and sensitive presentation. – Highly Recommended. Deeply moving, informative and well-written, this book shines a light on the human stories behind the grim statistics regarding the plight of prisoners of war of the Japanese. A chapter is devoted to each of the men whose stories are told, all of whom deserve our utmost respect for all that they suffered, not only during their time as POWs but for the rest of their lives. I'd intended to take my time reading this book but found that I had to keep reading to the end. Recommended. A moving account of the effects on families when their loved ones returned from being interred in Japanese prison of war camps. My father;s story was one of those included in this book, the author used a sensitive approach and I found it comforting to read that other families had had similar experiences. As young children we did not understand why our father was shouting in fear or why he was having nightmares it was not talked about. It was only when we were adults we began to understand some of the horrific experiences our father's had endured through reading books and articles. The author ensures that in the telling of these stories that the experiences the men suffered will never be forgotten and will be here for generations to come. A moving account of the lives of 22 Far East Prisoners of War (FEPOWs). A reminder of the forgotten heroes and the lasting legacy of WW11 under the Japanese. Very well crafted and conveyed by Ellie Taylor with material from the FEPOWs and their families. The title of Ellie Taylor’s book, ‘A Cruel Captivity’ captures in three short words the experience of the many prisoners of the Japanese in World War Two. It was cruel and the treatment measured out to the prisoners flew in the face of all accepted conventions as to how POW’s ought to be treated. I have often spoken of how, on the release of those who survived the experience, they were told not to talk about it. Here, in this eloquently written book, for the first time I came across a document giving a reason for this request. Entitled, ‘Guard Your Tongue’ it states that this request is being made in order to prevent further suffering to the families of those who died in such dreadful conditions. Almost to a man this request was adhered to but the cost to the survivors who remained silent was high. The horror of those years was pushed deep down into the sub-conscious with the inevitable result that in middle life the terrors involuntary made their own appearance through dreams, flashbacks and nightmares. Many a child of a former POW will testify to the fact that their father never spoke at all about his confinement and that this caused both him and his immediate family some distress. Now, before the last survivor of those terrible experiences is dead Ellie Taylor has collected the stories from 22 servicemen from the joint services and volunteers and recorded them for posterity. The author has been meticulous in her research and has written sensitively about captivity and its aftermath. World War Two is now disappearing from living memory and it is all the more important that before the last prisoner of the Japanese dies this book should have been written. The bravery of those men should never be forgotten and the horrors they endured should remind us all that within all men and women regardless of race, creed or culture there lie destructive forces. This book should have a place on the shelf of every man or woman who longs for peace in this troubled world and who is grateful for the many who gave so much that we might enjoy liberty. Terry Waite CBE, humanitarian and author. Ellie Taylor has produced a poignant tale of not only the suffering of these men but of the comradeship that sustained the survivors. The work has been well researched and help was received from the Imperial War Museum, Java FEPOW club and the Thai Burma Railway Centre. Carefully and sensitively researched, A Cruel Captivity differs in a number of respects from other moving POW accounts , in that it covers the experiences of 22 servicemen who were held captive in numerous locations through South East Asia. The book also examines the various mental and physical effects that the prisoners' captors' treatment had on them. The author's handling of the 'legacy' of their experiences during the post-war years makes this moving book particularly important. For a full understanding of this dreadful aspect of the Second World War, A Cruel Captivity is a must-read. My father's story is one of those included in this book, at first I was apprehensive about sharing such sensitive information, however I have to say that the author has handled the information with great sensitivity and understanding. This is an emotional book to read and more so because we from the COFEPOW (Children of Far East Prisoners of War) community have lived with the effects of the FEPOW's experiences through the years following their captivity. There were no mental health services to help us to adjust to some of the experiences we had due to no fault of our father's reliving their terror. This book allows the story of the families to be told, I have found sharing the experiences of great comfort and as the author advises it is a shared understanding that ensures our father's experiences and life stories will not be forgotten. Fred Cox was born in 1916 and brought up in a children’s home. He joined the army at eighteen. His wartime experiences as a prisoner of war of the Japanese are told in this book. He married Joan who was his nurse in Ceylon after his release. They set up home in Buckinghamshire and had two children. Joan died in 1989 and Fred in 1991. Ellie Taylor, who is the daughter of Fred Cox, a former Prisoner of the Japanese, was born in Buckinghamshire in 1952.
went on to work as a voluntary counsellor with vulnerable adults. She edited Faith, Hope and Rice, her Father’s Second World War POW memoirs, which is published by Pen and Sword Books. Now retired and living in Staffordshire, she has two daughters and six grandchildren.